Discover benefits of pineapple! 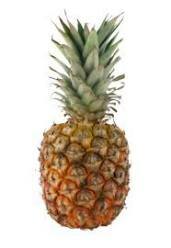 Pineapple is a sweet, spiked, fruit that grows close to the ground, not in trees. This cholesterol and fat free fruit is a powerhouse of nutrition! It has a high content of vitamin C and manganese with a good source of copper, vitamin B1, vitamin B6, fiber, folate and pantothenic acid. Pineapple contains a powerful enzyme called bromelain, which digests proteins. It has a high source of fiber. It is one of many antioxidant fruits! The health benefits of pineapple are numerous! Pineapple season is March through June. They stop ripening when they are picked. Choose pineapple with a sweet fragrance. Avoid musty or sour scents. Carefully inspect the pineapple. Avoid soft spots and bruises. Pineapples can remain in room temperature for 1 - 2 days before serving, allowing them to soften and become more juicy. After a couple of days, wrap pineapple in plastic and store in refrigerator 3 - 5 days. 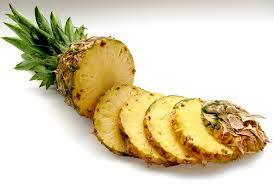 Store pineapple chunks in refrigerator, in air tight container to expand their freshness. Pineapples are perishable. Discard pineapple and any fruit that spoils. Pineapples can be frozen but diminish in flavor. Pineapples can be used in a variety of homemade recipes. I love pineapples! I eat them alone, mix with fruit salads, blend in smoothie recipes, top over ice cream, add to pizza, bake with chicken and fish recipes. There are numerous ways to incorporate pineapple in your homemade recipes. 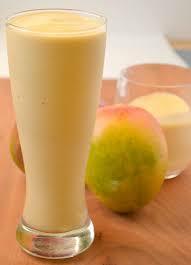 Pineapple juice is also used in a variety of recipes. Where do free radicals come from? They attack the body’s cells from different sources: alcohol, tobacco, prescription drugs, pollutants, sun bathing, ultraviolet rays, X-rays, gamma rays, radioactive material, exhaust fumes, industrial fumes, obesity, stress, harmful chemicals, food additives and pure oxygen. Free radicals speed up the aging process with the breakdown of collagen and reduced oxygen levels found in cells. When free radicals overcome antioxidants, they may lead to wrinkling, pre-cancerous and cancerous skin lesions. Antioxidants are chemical compounds that inhibit oxidation. They are the body's friend. They seek out, neutralize and destroy free radicals wrecking havoc on the body, inside and out! Vitamins A, C and E, beta-carotene and selenium are common antioxidants. They assist skin repair, strengthen blood vessels, reverse discoloration, reduce wrinkles, and protect against sun damage! Eat antioxidant fruits and other antioxidant foods! ANTIOXIDANT FRUITS: Apples, Apricots, Berries, Grapefruit, Kiwi, Mangoes, Nectarines, Oranges, Papaya, Peaches, Pineapple, Plums, Red Grapes, Tangerines and many more! (I choose to eat organic foods/fruits). Find homemade skin care tips!